Tom doesn’t need any more women in his life. He already has a five-year-old daughter, an estranged wife who keeps blocking his efforts to get divorced and a mother who might be having an affair with the vicar. 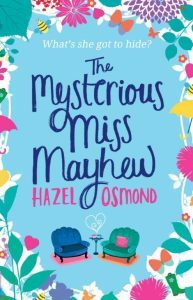 When Fran Mayhew turns up – years younger and with all the tact of a dinosaur with its backside on fire – she’s just another tricky person to deal with . . . And what’s she doing in his remote part of Northumberland crawling around in graveyards anyway? But Tom discovers that there’s more to Fran Mayhew than meets the eye – and soon he’s in danger of losing much more than his heart. Tom knew if he took his trousers off now, he was going to die of embarrassment rather than loss of blood. Which was weird because earlier he’d been quite happy to fantasise about Fran and taking his trousers off. Now he felt like some terrified adolescent.